White Heat NYE party at the Lexington. Advance online ticekts have sold out. We'll have some available over the bar at the Lexington on Tuesday 30th from 15:00 and Wednesday 31st from 13:00. Email for more info. White Heat Djs 21:00 - 4am. Tickets are £15 Advance and sold out in all of the past ten years! It's the birth of another New Year and we're going to be celebrating with White Heat & Nightcare Djs and all round fun times with the lasers, smoke machines, party poppers and waves of broken resolutions you'd expect. Come and celebrate the start of 2014 at the Lexington! Upstairs we'll be playing an eclectic mix of indie hits, dancefloor fillers, some Disco, and everything else in between. Downstairs we'll be starting in the sixties and heading newer as the night goes on. Expect Soul, Psych, Garage Rock and Roll, Disco & more. 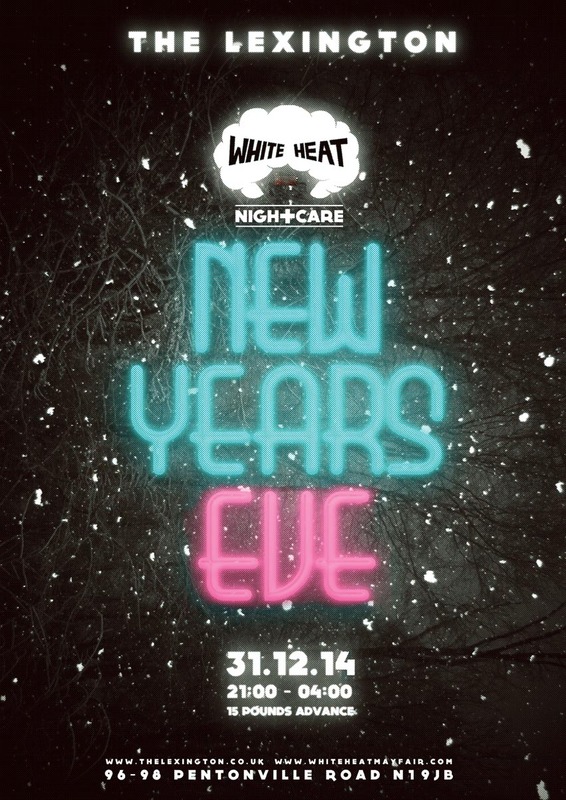 White Heat NYE parties have sold out for NINE years in a row so make sure you get your tickets in advance to avoid disappointment and help make it a straight ten!